I really spend time when making this map. I used it to show my DMmap making skills for Critical Mass team and they liked it and I joined in their team! 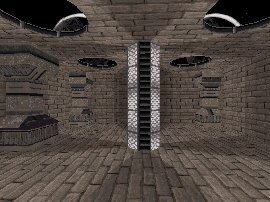 Inspiration came from one Quake level! you can play it with bots by launching "play_bots(2)".bat file. "Play_bots(2)".bat requires V1.4 or more but it runs in both versions without atomic bots!